When I was a kid back in Hawaii, I used to watch my uncle light his charcoal by splashing gasoline from his gas can onto the pile of charcoal, then tossing a lit match from about 3 feet away. It made a big “whoomp” sound and produced an awe-inspiring fireball before dying back down. Whatever we’d grill over it had a distinctive taste of gasoline on it. YUM. It seems that a lot of people learned how to start charcoal from the same school my uncle did. Because even today, I see people doing the same thing, except with large squeeze bottles of lighter fluid instead of gas cans. What’s worse, they will actually squirt the fluid onto the burning flame! Can you say “third degree burns“? Once the lighter fluid burns off after a minute, the coals are (of course) still not lit. What’s the next step? Fanning, of course. The pyromaniac grabs an empty pizza box or a thick section of newspaper and begins vigorously flapping his makeshift fan up and down, side to side, in an effort to turn that small flicker of red into a medium-sized flame. He huffs and puffs and blows himself blue, silently wishing for a hair dryer and a very long extension cord. After 15 sweaty minutes, the coals are about ready to go. Success! Now, if you’ve learned from this “fireball then fan” school of charcoal lighting, may I suggest a safer, saner alternative? Get yourself a charcoal chimney. You just load it up with charcoal, crumple up a couple or three sheets of newspaper (I like to use veggie oil-infused paper towels because they don’t make as much smoke and ash) into the bottom of the chimney, light the paper, and let it go. As Confucius say, “Set it and forget it!” Fifteen minutes later, you’ll have flames coming out the top and coals ready to cook. Plus, no nasty lighter fluid flavor on your food! Charcoal chimneys run you around $15 at most hardware stores. Get one. It’s cheaper than a trip to the emergency room. 1. Rinse off the roast, pat dry, and trim the excess fat off, leaving at most a 1/4 inch thick fat cap on one side of the roast. Once you’ve got the charcoal chimney started, rub the seasoning mixture all over the roast. 2. Pour the coals out into the WSM’s charcoal ring. Take the top grate and put it directly onto the charcoal ring. Lay the roast, fat side up, onto the grate. Grill for 2.5 to 3 minutes to get a good sear, then flip and sear another 2.5 to 3 minutes. 3. In the mean time, take the water pan out of the WSM’s middle section, then put the bottom grate back in. Once the tri-tip is done searing, move the roast to the bottom grate. Remove the top grate from the charcoal ring. 4. Since authentic Santa Maria tri-tip uses red oak coals for their distinctive smoke flavor, I toss chunks of red oak onto the charcoal. A friend of mine brought back a bag of chunks for me from Santa Barbara. If you can’t get red oak chunks, use whatever kind of oak wood you can get your hands on. 5. 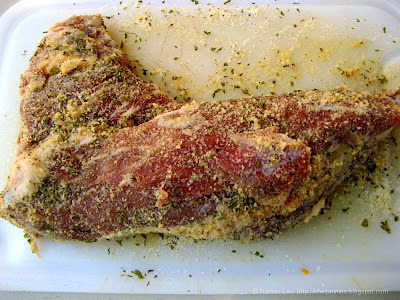 Place the middle section of the WSM, containing the tri-tip roast, over the bottom section. The meat is now sitting about 2 feet directly over the burning coals. Insert a probe thermometer into the middle of the roast, then cover with the top section. Leave all the bottom vents open for maximum airflow. What we want to do is raise the temperature up above 350* F so that we’re up in the high barbecue / low grilling range. 6. 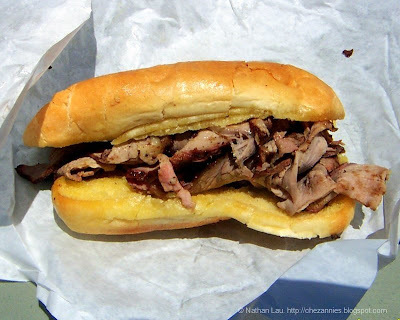 Leave the roast alone – no peeking! If you’re lookin’, you ain’t cookin’ (remember Confucius?) Set your target temperature for 145* for medium doneness. It should take a half hour to 45 minutes. When the roast hits the target temp, remove it from the smoker, set it aside and tent it to rest for 15 minutes. 7. 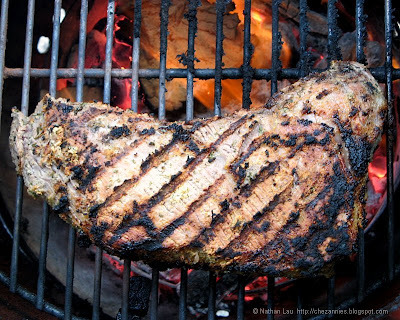 Slice the tri-tip thinly across the grain. You should be able to clearly see the grain as it runs across the top of the meat. 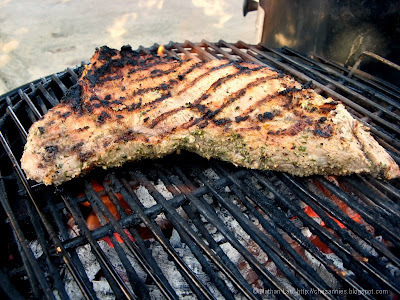 This recipe was entered in the Monthly Mingle – Grill It! event and the Eat Healthy – PROTEIN Rich event. >Annie, that looks like a great 4th of July recipe. >Great-looking hunka beef! Yeah, I can’t really find tri-tip here (not a popular cut), but good to know that sirloin can be used instead. Haven’t tried the smoking thing (too intimidated). >Yet again, I find some great stuff on your blog. I just grilled some tri tip and served with grilled corn and black olive aioli. Come take a look when you have a chance and let me know what you think. >@CrabbyCook: thanks! Hope you have a great 4th! @JS: I highly recommend the Weber Smokey Mountain. It easily makes barbecue like you wouldn’t believe. @Joe: nice job on the tri-tip! 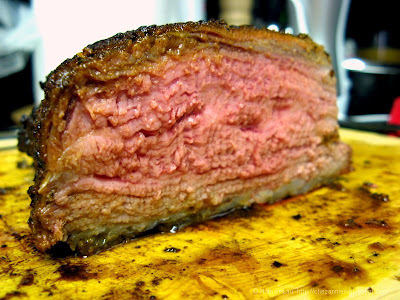 >Never had tri-tip, I have to look out for this cut now… Love that first picture, so pink and moist…yummmmmm………. Thanks for sending this over to MM-Grill It! >Oh that does look good. And a wonderful way to prepare it. Thank you for sending this to the mingle. >great entry and a nice step by step explanation…. >You can use white oak in place of red oak for a similar flavor to Santa Maria style. 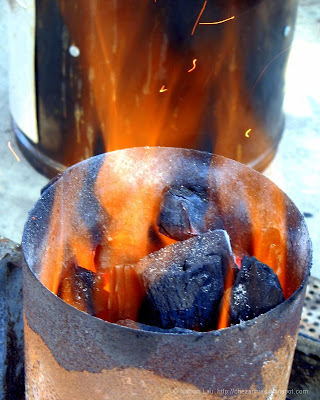 If you use charcoal or gas – not SMS. 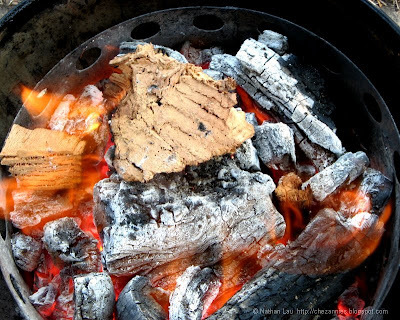 My family will use red oak bark for mini webers – the coals keep just long enough for a perfect tri-tip. >Wow. That looks good! 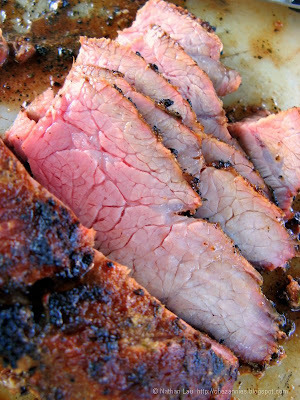 I have not cooked a tri-tip but I see them in my BBQ books. Have to try it soon. SWIFT Theme by Satish Gandham. 54 queries in 0.755 seconds.